Many people want to know how scoliosis starts and how do you get scoliosis? After all, scoliosis is a common problem throughout the world. Some curves in the back are natural, but nearly 1 in 100 people suffer actual scoliosis, curvature of the spine, cracking back, and pain. How does it happen? There are three types of scoliosis, each having a different origin: idiopathic, congenital, and neuromuscular scoliosis. How Do You Get Scoliosis of the Idiopathic Type? Idiopathic scoliosis is so-called because it is “idiopathic” which means having no truly detectable cause. While the true cause may not be fully understood, recent studies seem to indicate that this condition might be caused by multiple genes that, together, express themselves in a way that causes the rotation and curvature of the spine characteristic of idiopathic scoliosis. How Do You Get Scoliosis of the Congenital Type? Congenital scoliosis is acquired before the child is even born. This type of scoliosis usually develops very early and might even been seen in an infant. Despite the sound of the name, there does not seem to be a genetic contributor to this form of scoliosis and it is not passed through family lines. Congenital scoliosis is usually classified into one of three causes: failure during formation, segmentation failure, or both types combined. Failure of formation or hemivertebra is caused by an imbalance in the spine resulting in crooked growth. Literally, one side of the vertebra forms and grows normally while the other doesn’t. The normal side expands while the abnormal, contracted side does not – resulting in abnormal curves. This type is the most common cause of congenital scoliosis. Segmentation failure happens when several vertebrae fuse together during development causing blocks or bars of combined vertebrae. These fused areas stop the spine from growing and expanding normally. The lack of ability for growth in these areas causes the spine to become distorted and crooked. Both hemivertebra and segmentation failure can occur simultaneously to a greater and more devastating effect. The curvature can happen in any direction, so that scoliosis, lordosis, or kyphosis treatment may be necessary to the child. How Do You Get Scoliosis of the Neuromuscular Type? Neuropathic scoliosis is the condition associated with some nervous system or muscles of the patient. Cerebral palsy, trauma to the spine, injuries, muscular dystrophy, and spinal bifida are all potential causes of neuromuscular scoliosis. 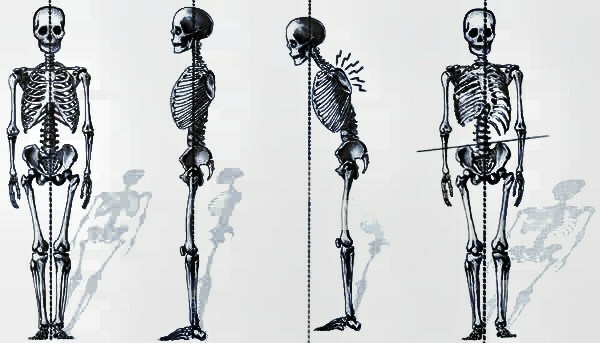 Abdominal muscle and trunk weakness cause posture issues and pulling of the spine to one direction resulting in twisted vertebrae. The lack of abdominal and trunk muscle support combined with progressive twisting of the spine can cause great strain to the vertebrae in patients with neuromuscular scoliosis. Over a long period of time, this weakness may lead to degeneration of the vertebrae and eventual herniated disc treatment. Scoliosis can be either subtle and undetectable, or severe, resulting in the need for treatments, therapy, or even surgery. No matter what type, the person who finds themselves or their loved ones a victim of scoliosis might find these answers to the question “How do you get scoliosis?” helpful in understanding the disease and its progression.